This is a saddle-billed stork. Storks are a family of large, stout billed wading birds. 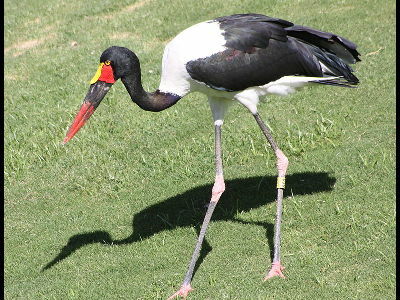 You can tell the difference between Storks and thier reatives by their bill shape. 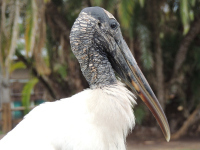 A Stork has a long straight bill that curves inward at the tip. The Marabou Stork has one of the largest wingspan of any bird, reaching 9 and 3/4 feet. 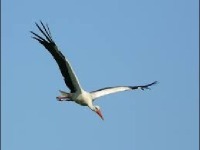 Having a nest of a Euopean White Stork on your roof is sometimes considered good luck. The Scarlet Ibis, a relative of the Stork, sometimes travel in groups of up to tens of thousands.